The latest “whole home coverage” system to cross paths with the Cool Tools testing team is from Amped Wireless. The ALLY Plus system includes a router and extender unit that looks a bit like a wireless mesh system (since both units have somewhat the same design), but in fact is more in line with a traditional router/extender offering. However, like those wireless mesh systems, the ALLY Plus is installed via mobile app that makes setup go quicker for those non-techie types. In addition, features such as in-depth parental controls and a security partnership with AVG means device protection for all clients connecting through the router. In a rather amusing “dummy-proof” situation, Amped has already connected the Ethernet cable on the router device, so you don’t get confused when connecting it to your broadband modem (putting that end in the correct port is still up to the end user). In addition, both power adapters and cables are labeled either “router” or “Extender,” so there’s a 99% chance that grandma or Dad will get this right. Before you even plug things in, Amped asks you to download the ALLY app to your mobile device (iOS and Android supported, I tested via iOS). This will then give you the step-by-step directions for installation. This means unplugging the modem and re-plugging it in, connecting power to the router and then attaching the aforementioned Ethernet cable. The app then takes over, asking you to connect to the router’s internal wireless SSID (via the Settings on your mobile device), and then having you change the name and password to something more your liking (this time, my network name was GoPats24 and GoPats5Gig). Because this is a dual-band network system, you can provide different names and passwords for the 2.4 GHz and 5GHz network bands. You can stop there and have a completely functioning Wi-Fi router, or you can move onto the bonus round – setting up the extender. 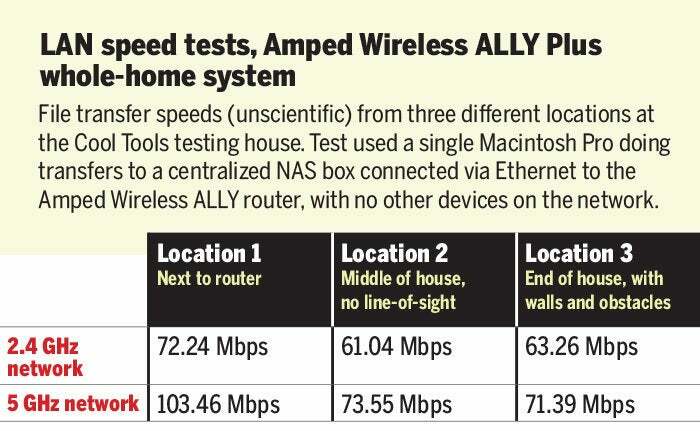 Amped Wireless recommends putting the extender on a different floor (if you live in a multi-story home), but also about halfway between where the router is sitting and the edge of your home (pretty standard extender rules). Connecting the extender is as simple as plugging it into a power outlet – the extender uses a proprietary signal to receive the network credentials (name and password) from the router, synchronizing everything. With the extender now in place, I was now able to receive a Wi-Fi signal in every location of my home, even the concrete-walled garage (although it was a bit weaker than other spots). Yay! The router has separate names for the 2.4 GHz network and 5 GHz network, which gives us the opportunity to do two speed tests at each of our locations. I was very impressed with the 100+ Mbps average data rate for the 5 GHz network in the first location. Oddly, the average data speed in Location 2 for the 2.4 GHz network was a bit slower than the speed from Location 3 on the same network. I’ve seen that a few times, which indicates that it’s possible that there are likely more obstacles (walls, books, chairs, etc.) slowing down the wireless signal, or it has something to do with whether the client is hitting the router or the extender. Because there’s no way for the client to pick which device to route to, it’s possible that the signal is traveling farther than when it hits Location 3. 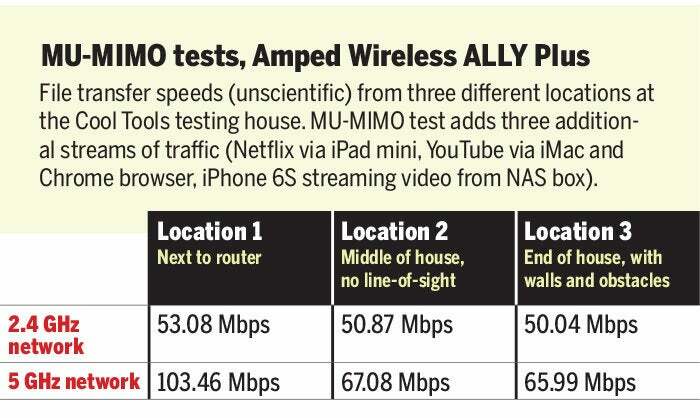 Next up was the MU-MIMO test, in which I had three different devices asking for streaming traffic (Netflix, YouTube and movie streaming from a Seagate NAS box) while also performing my file transfer tests. In this case, I was impressed that the 5GHz network could maintain the 100+ Mbps rate in the first location; in addition, speeds didn’t drop much between the second two locations. With the partnership with AVG, it’s clear that this system has security in mind, but I was also very impressed with the depth of the parental controls. From the Ally app, every device that joined the network could be assigned to a user, once you set up a list of users via the app. For families, that means each kid and adult can have their own profile, and devices can be assigned to them. For each user, you can choose to block categories of web traffic (such as Adult, Crime & Violence, Dating, Drugs, Alcohol & Tobacco, Gambling and Weapons) or types of content (blogs, email, entertainment, games, photo sharing, social media, etc.). One category that made me laugh was “School Cheating” – having been away from school for so long, I wasn’t aware that these sites existed (send me an email with some more notorious ones, please!). Going beyond just the website filters were App blocking functionality, with apps like Netflix, Facebook, Instagram, Snapchat, WhatsApp, Xbox Live and others – it’s a good way for parents to see a bunch of different apps that kids may now be using. The app also lets you set a curfew for each profile/user, which blocks traffic access between a starting time and end time. If you forget about the curfew, there’s a big orange “Pause” button that lets you shut off access for that user (and all devices tied to that user). The only thing missing is the ability to set a daily time limit – something that we’ve seen on the Circle by Disney add-on device. Coming soon from Amped Wireless, via firmware update - users can receive an "activity report" of sites that users are visiting. This feature was unavailable during my tests. On the security side, the app lets you enable an “Online Shield”, which turns on the AVG protection. This means the router will scan Internet traffic on the network and automatically block known malicious links or websites (through the filtering settings) on the router, before it reaches the client device. This still won’t protect you against Zero Day attacks and exploits, but it’s still a lot better than trying to enable software on each individual client (although I’d recommend doing that as well). Amped says this feature is managed by AVG/Avast antivirus via the cloud, and is constantly updated. Trying to visit one of those blocked sites (let’s say, for example, an adult site) brings up a screen on your browser (see above) that indicates that it’s been blocked by the site administrator. This worked with a variety of different browsers and private/incognito modes. The system is also supposed to alert the administrator when a malicious site is detected, but I didn’t get an alert during my attempts (this is also being updated via the next firmware update, Amped says). The app has a tab for advanced settings, but interestingly clicking on that brings up a screen that tells you to connect your tablet or PC to a special website (with a unique access code). Logging in this way gives you a larger dashboard view, with the ability to view the IP address, Wi-Fi settings and firmware versions. Clicking the More Settings tab brings up a whole bunch of other settings that network types will recognize, letting you fiddle with Wi-Fi channels, LAN and WAN settings, enabling/disabling UPnP, IPSec and PPTP passthrough (among other choices), as well as port filtering, port forwarding and creating a DMZ. You can also enable Denial of Service (DoS) Prevention via the browser settings – you don’t see that often on a home wireless router. There’s also a Quality of Service (QoS) section that lets you prioritize specific data traffic or devices, but that’s handled much easier through an app than the browser settings (in fact, they should add device prioritization to the ALLY app). Bottom line: Anyone looking for a modern router with additional parental controls and security offerings should check out the ALLY Plus. While the router-and-extender method isn’t quite the same as a wireless mesh offering, the supported range does qualify it for the category of “whole-home coverage”, and the LAN speeds are well within (and beyond) some of the more traditional router offerings I’ve tried recently. With advanced settings for network junkies, this system should fit the bill for almost any networking scenario you can think of, yet also be a good system for non-techies as well.